Spaniel Journal's twelfth anniversary is just around the corner. To celebrate, we are unveiling a fresh look and some exciting changes. I'm welcoming as Contributing Editor, Benjamin "Chip" Schleider, who has appeared regularly in Spaniel Journal, over the years, most notably with his popular series The Dixie Chronicles. Chip is an accomplished writer, often published is a variety of outdoors magazines. In addition, he is a co-author of a fine training book, Urban Gun Dogs, now in it's second printing and which is also available digitally. New to Spaniel Journal is our Roving Reporter who will be interviewing professional and successful amateur trainer/handlers, providing regular columns to assist the field trialer. 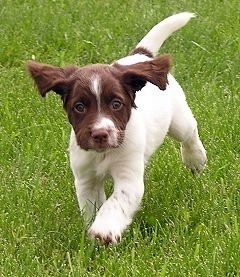 Be sure to "like" our Spaniel Journal facebook page to keep current as new articles are published. Once again, it's time to sharpen your pencil in preparation for the Spaniel Journal Writing Contest. 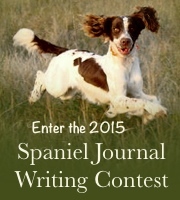 Entries must feature spaniels, will be judged on quality of writing and be received no later than June 1st, 2015, via the email address, below. All submissions should be pasted into an email and if photos are available, please do not send with your entry. 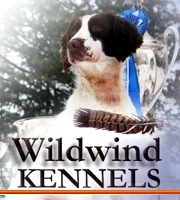 Winning essays will be published in future issues of Spaniel Journal. On behalf of Glenn's brothers, I would like to make a few remarks. I will focus on three qualities of Glenn's life: the first quality I think made Glenn an interesting man; the second quality made him an admirable man and the third quality made him a most fortunate man. Glenn was an interesting man because he pursued those things that caught his interests with such passion, enthusiasm and dedication. One could see that throughout his life. Champ was Tom's first and only hunting dog, and Tom was Champ's first and only human. Because of this, neither had any preconceived ideas about what the other could or could not accomplish.